Much to the dismay of the Vatican, an approx. 1500-2000 year old bible was found in Turkey, in the Ethnography Museum of Ankara. 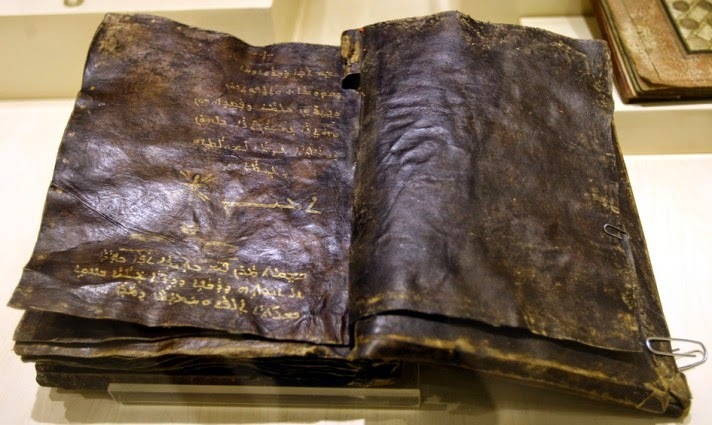 Discovered and kept secret in the year 2000, the book contains the Gospel of Barnabas – a disciple of Christ – which shows that Jesus was not crucified, nor was he the son of God, but a Prophet. The book also calls Apostle Paul “The Impostor”. The book also claims that Jesus ascended to heaven alive, and that Judas Iscariot was crucified in his place. A report by The National Turk says that the Bible was seized from a gang of smugglers in a Mediterranean-area operation. According to reports, experts and religious authorities in Tehram insist that the book is original. The book itself is written with gold lettering, onto loosely-tied leather in Aramaic, the language of Jesus Christ. The text maintains a vision similar to Islam, contradicting the New Testament's teachings of Christianity. Jesus also foresees the coming of the Prophet Muhammad, who would found Islam 700 years later. What does this mean to atheists/agnostics/secular thinkers? Is the text real? Fake? Does it matter? Hopefully, this news inspires the religious to ask questions, instead of pointing fingers or believing anything blindly. Please, don't go poking fun or tossing around the “I told you so!”s. The biggest danger of faith is when people believe what they want to believe, defending against any and all evidence; especially when that evidence revolutionizes their foundation from the ground up. And the biggest culprit to that danger is the ego trap: rejecting/criticizing others, for being unlike you.